WHAT IS A DENTURE FULL AND PARTIAL? A denture can replace all of your teeth or some of your teeth (partial denture). Dentures are removable tooth replacements that are made of plastics and metals. Replacing missing teeth will help you eat, speak and chew better. The denture process takes four to five appointments to allow for proper fit, form, color and function. For the first few weeks, your new denture may feel awkward and uncomfortable. However, your mouth will become accustomed to wearing it. Adjustments are a necessary part of the treatment. As your mouth naturally changes, minor adjustments and repairs may be indicated. It is important to have periodic dental visits even when you wear a denture. We can examine your tissues, clean your remaining teeth, and check the fit or your removable denture. Also, implants can now be used to support your denture, giving you a better feel and fit! We feel confident that after a few weeks you will become adjusted to your new denture/partial. We have done our best to provide you with a well-fitted, functional and esthetic appliance. Over time, your gums and bone will shrink when there are no teeth present. 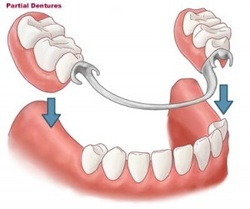 When this occurs your dentures/partial may feel loose. An ill-fitting denture/partial can easily be relined. Sore spots – it is common to develop “sore spots” after receiving a new appliance, a reline or repair. These areas can be relieved with a few follow up adjustment appointments. Cleaning – your dentures/partials can be easily cleaned with a denture brush and toothpaste. They can also be cleaned using denture tablets and water. Denture wearers may brush their gums with a soft toothbrush on a daily basis. Partial wearers must reduce the risk of decay on their natural teeth with diligent brushing. It is highly recommended to leave your dentures/partials out overnight. Chewing – the new bite may not feel completely comfortable for several weeks. We can adjust these areas as the denture/partial settles into place.